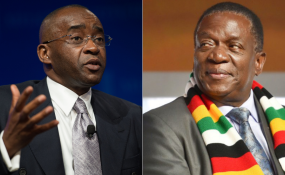 FOUNDER and executive chairman of Econet Group Mr Strive Masiyiwa has added his voice to the anti-sanctions lobby, saying it is high time the West removes the restrictions it illegally imposed on Zimbabwe. In an interview with CNBC Africa television channel, Mr Masiyiwa said the sanctions were no longer justified and should be removed as no country can prosper with "its hands tied at the back". He said the changes which had taken place in Zimbabwe were real and the country deserved a chance to turn around the economy. "I have invested in Zimbabwe (in the last 10 years), 1,5 billion US dollars," he said. "I am as committed to investing in Zimbabwe as I have always been come rain or shine. But concerning the change that has taken place; I believe it is real. "I believe President Mnangagwa is sincere with the things he wants to do. It is going to be extremely challenging. Everyone knows that. Anyone who understands economics knows it's going to be tough going but I think that Zimbabwe needs to be given a chance." Mr Masiyiwa said sanctions had to go, adding that Zimbabweans should focus more on economics than politics. "We have to stop the politicking and focus on rebuilding this country... And I am right up there. I think the sanctions, should be removed. There is no justification for them anymore and I have always been on record to say the sanctions are not justified. Now we are almost 20 years into the sanctions. You can't have one country operating with its hands tied behind its back." Government and sections of the opposition welcomed the telecoms tycoon's statements saying Zimbabwe needed all the support it can get to grow the economy. "Government welcomes statements by @StriveMasiyiwa <https://twitter.com/StriveMasiyiwa?ref_src=twsrc%5Etfw> calling for the removal of sanctions imposed against the country," the Ministry of Information, Publicity and Broadcasting Services tweeted yesterday. "The country requires all the support it can get to create an environment that is conducive for the revitalisation of the economy." The West imposed sanctions on Zimbabwe in early 2000 after the country embarked on a land reform programme to redistribute land to the majority blacks." Posting on his Twitter handle, MDC-T vice president Mr Obert Gutu backed Mr Masiyiwa's call. "Truth of the matter is that sanctions have brought about untold suffering to the majority of Zimbabweans living in both the urban and rural areas.The people against whom these sanctions are intended hardly feel their effect. The poor majority are most affected. Sanctions must GO!"